Ameritex Movers is proud to host National Night Out at its Houston headquarters Tuesday, Oct. 2. With food, drinks, music, and games, we’re excited to keep this tradition alive by promoting neighborhood safety and community wellbeing in the Houston area. National Night Out is an annual event to help you get to know your local police force, build camaraderie with your neighbors, and promote the overall safety and security of your community. Don’t miss out on this once-in-a-year chance to get the family together and make our Houston community even stronger! Founded in 1984, NNO is a nationwide opportunity to host block parties, cookouts, barbecues, and parades, all in the spirit of community. 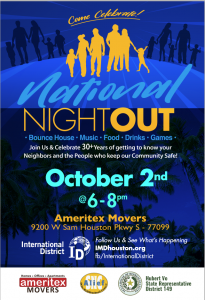 Ameritex Movers is excited to host the night out in the Alief community along with the International Management District. “Community involvement and public safety matters to us, and National Night Out is designed to build camaraderie and strong partnerships, annually, between the community and law enforcement in a common place for a common purpose,” said Beth Rohani, Ameritex co-owner. “The event will bring together friends, families and leaders from the Alief community and will embrace our values of continued community service,” Rohani added. When: Tuesday, Oct. 2 from 6 to 8 p.m.
All ages are welcome, so bring the whole family for a night of food, fun, and fellowship! Know your neighbors. Knowing and looking after each other is crucial to neighborhood safety. Block parties and barbecues are great ways to create a tight-knit community, which is key to crime prevention. Look out for suspicious activity. This could include open doors or windows, service vehicles parked at empty homes, or unexpected visitors at odd hours. Don’t post your vacation dates on social media. On the contrary, you should let your neighbors know when you’re house will be empty so they can report suspicious activity. Motion-sensored lights are a great way to deter trespassing at night, and they can also deter crime at your neighbors’ homes as well. Maintain your yard. A well-kept yard lets potential criminals know you’re an active and attentive homeowner. Keep your valuables out of sight by not leaving them in your parked car and closing your blinds at night. Install security systems. This critical safety measure also helps your neighbors, as it only takes one ringing alarm to alert criminals to your neighborhood’s diligence. Crime prevention can’t be done alone. Attend your local National Night Out event to meet your neighbors and local law enforcement, and have a great time with your friends and family. Join us in community and fun at 9200 W Sam Houston Pkwy S, Houston, TX 77099 on Oct. 2 from 6 to 8 p.m.